Wait, what? Did somebody get the wrong design sheet? Jason Todd was taken under Batman's wing as a teenager after he was caught stealing the Batmobile's tires. He became the Dark Knight's protege as the second Robin until his untimely death at the hands of The Joker. After his mysterious resurrection from the dead, Jason took on the identity of Red Hood and embarked on a crusade of violence and revenge against The Joker and Batman - who he believes betrayed him by letting the Clown Prince of Crime live. "Hey Mike, you know that character nobody really cared about until the New 52 reboot? Remember the time he was in that story no one remembers, wearing that costume no one liked? Let's make a toy of that!" "Say, Jerry, when they hear we're making a Red Hood figure, won't most fans assume it's his 'body armor and leather jacket' costume?" "Yes they will Mike!" "Or failing that, the original 'tuxedo' Red Hood?" "Even liklier than the last!" "But then Jerry, won't our customers be disappointed or even mad when they open the box and find this figure?" "They sure will, Mike!" "Then why are we doing it this way, Jerry?" "Because this is Mattel, Mike! The company that released four Barry Allens before ever getting around to Wally West! We never met an idea we couldn't do the wrong way!" This Red Hood costume was designed by Frank Quitely, and pretty much misses the mark in every way imaginable. Since his resurrection, Jason Todd has been anything but "superhero-y" (with one exception), and yet that's exactly what this is. 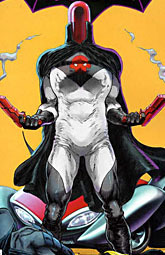 It's a white spandex bodysuit with black gloves and boots, a flowing black cape, and a black diamond pattern on his chest with a red skull emblem. The excuse in the story was that Jason was trying to "brand" himself as a new hero for the people of Gotham in a bid to replace Batman, which at least makes sense with his characterization, even if it's not a great idea. Like Xorn, Red Hood plays to Frank Quitely's strengths as an artist: namely, he doesn't have a human face. The guy's a great layout artist, but his faces are garbage. Rather than the cool, fitted red helmet he'd been wearing since coming back to life, Jason's gone back to the original "tall dome" helmet. Because when you're trying to set yourself up as a new hero, you want to look like a walking lipstick. The figure uses the small male body, which is fitting - it's the same mold Nightwing used, and they were similarly sized guys. What can we say? Bruce has a type. The head and cape are new, obviously, but the forearms are new as well. Really? Are his gloves that unique that they had to sculpt new arms, rather than just paintnig them on? The tops of his boots are painted on, so why don't they get the same treatment as the arms? He uses Vigilante's left hand (the one with the extended trigger finger), but his right is just a normal curled hand. I think we all would have prefered the forearm budget went to making a new right hand. 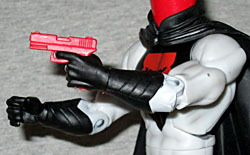 The trigger finger thing is particularly annoying because Red Hood is one of the few DCSC figures to come with accessories. 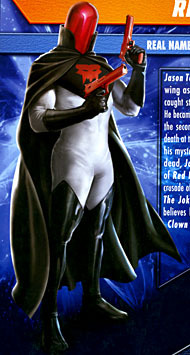 Naturally, he gets the two red pistols he wielded while wearing this costume. They're the same sculpt as the pistol included with Movie Masters Lt. Gordon, though it's possible they're a new mold - remember, The Question used the same base sculpt as the Gotham City Thug, but was clearly molded in larger tools. The guns are nice, but he only has one trigger finger so he only holds one of them very well. The paint is also rather disappointing. The black, white and red scheme is very striking, but there's one major flaw that can't be overlooked. The "white" suit is actually a pale gray with some airbrushed shadows, which is a nice way of giving the figure depth, but the paint is a little overzealous. 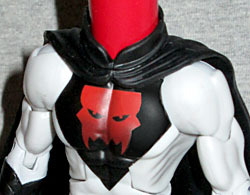 See, for whatever reason, Red Hood has a skull on his chest - the one on the toy matches the design seen inside the comics, rather than the version seen on the covers, but that's not the problem. There's an airbrushed shadow along the bottom of the pecs, which means the skull design fades to black as it lowers and thus looks incomplete. Putting Red Hood in a costume like this may be silly, but the Mike Thompson portrait on the back makes the suit look cool. The pose is very stiff and upright, and he's holding his guns like a model on The Price Is Right. "$600, Bob!" "Six-hundred and one!" It sounds boring, but remember: if Jason's intention was to win the hearts and minds of Gotham City, it would make sense that he would adopt a very artificial, showy posture. Don't think of this as a single moment captured in time, but as him posing for publicity photos. His cape hangs heavily off his shoulders (actually going in front of the shoulders like it's supposed to, instead of hanging off the back like the toy), and the light reflects off his tall helmet nicely. 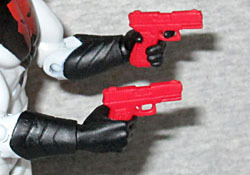 The way he's holding his gun up, however, does serve as a reminder that because Mattel one ever uses one elbow hinge instead of two, the toy can't actually raise its arm far enough to copy the pose. There's a vague sort of logic behind Mattel's choice to make this costume: it's graphically interesting, it doesn't look like many other toys, and the chances are almost zero that it will be made into a toy at any point in the future. 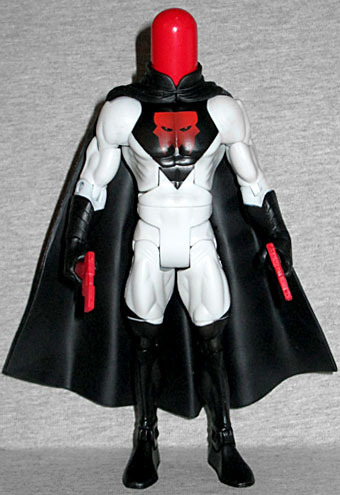 Plus, DC Direct already made a "classic" Red Hood a few years ago, so that's available is people really want it. Still, making the modern Red Hood would have been as easy as Mr. Terrific's body with Vigilante's shins and a new head. Maybe Starman's legs if you really wanted. Maybe Mattel is saving that version for one of their random Batman lines, but it's still disappointing that we didn't get it here.